Hookup this 1kg plus wolf herring this morning. It took my live bait and cause my reel alarm to screech. I stike and it do a acrobatic jump on the water surface. Easily wind back and use my rod to lift it up. 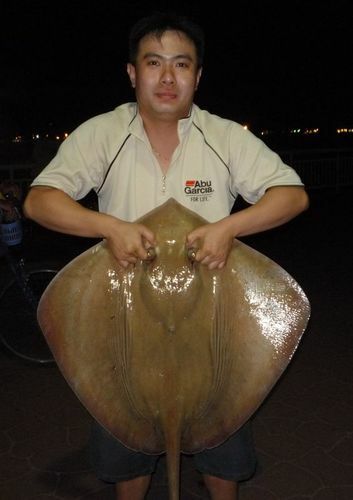 Raymond got his Shimano 3pcs joint rod tested when he hookup this 11.8kg stingray last night. The fish took the bait and go for a good run. It tired out after awhile before Raymond able to control it. He manage to surface it while I gave a fast gaff and bring it up. It weight 11.8kg on the scale.